The author was a soldier writing from the trenches. His poignant detail has been sensitively edited into a book by a leading military historian. The front leaf of the jacket identifies one of the factors that made the trenches of the Western Front unique in military history. For generations, soldiers and sailors have written home, often on the eve of a battle they might not survive. DESCRIPTION: The author was a soldier writing from the trenches. 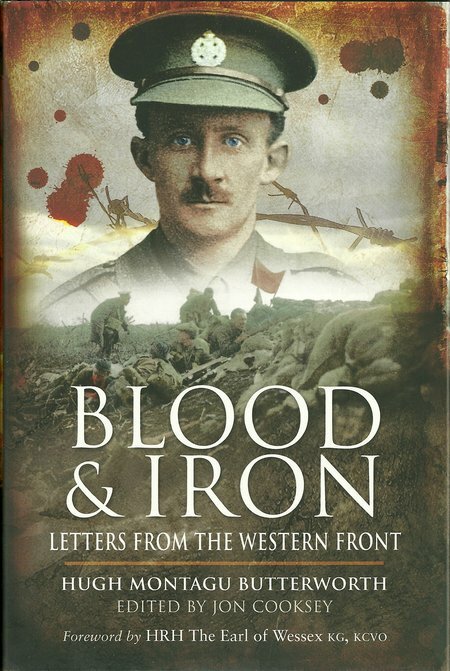 His poignant detail has been sensitively edited into a book by a leading military historian. The front leaf of the jacket identifies one of the factors that made the trenches of the Western Front unique in military history. For generations, soldiers and sailors have written home, often on the eve of a battle they might not survive. They continue to do so in current conflicts although now it is more often a video message or a call home on a mobile phone. This communication is one factor that binds all military conflicts. On the Western Front, the killing machine was efficient and chewed up millions of young men. In itself that level of attrition and intensity was at a new and terrible level, but the unique factor was the way in which familes and friends formed the British Regiments and Corps. Hugh Butterworth was killed in 1915 at Ypres in Bellewaarde Ridge, but in 1916 his first cousin, the composer George Butterworth, was killed on the Somme. Memorials in Britain, and beside the battlefields, contain long lists of family names where many not only shared the family name but were fathers, sons, uncles, and cousins. A large part of the British male population fought and died in the trenches. The best of a generation were often the first to die. Many returned, crippled by serious wounds and mental scars that lasted until they died decades later. Today, school children and adults visit the battlefields, usually escorted by battlefield guides, who have an encyclopaedic knowledge of the events on what are now pleasant fields and woods. Try as we may, it is impossible to fully realize the conditions on this same landscape during the Great War. Trenches filled with water, men moved and lived in mud and filth, permanently wet and cold until the summer sun made the conditions even more difficult as corpses in the no man’s land between the trench lines decomposed. A skeletal hand of a long dead comrade, protruding from the trench wall, might be used as a coat hook. For days artillery shells would descend in a continuous unbearable sound that ruptured ear drums and buried soldiers alive. To describe conditions as a living hell understated the environment into which newly trained soldiers were poured. To write home from the trenches, which many soldiers did, required determination and some skill. Hugh Butterworth was an articulate writer with a keen eye, producing a beautifully written record that is deeply moving, intensely personal. It is difficult to read his lines without feeling some of the emotions. Like so many of his comrades he died in the prime of life, never to suffer the decay of age and never to experience the middle life that so many accept casually. In battle, each person will have his or her perceptions and understanding, but although in later life survivors may say that war is terrible, the young in battle live intensely and life after war is monochrome against the technicolour of war. Communicating by letter, or after the war in discussion, a warrior has some difficulty in discussing what he or she really felt in combat and this is the challenge for the soldier writing home. Butterworth had been a schoolmaster and gifted cricketer before joining the Rifle Brigade as an officer, many of his comrades had come straight from school with no experience of life beyond home and school. His writing was therefore more mature and skilful. He seems less inhibited, describing his experiences with honesty and painting vivid pictures with words where many surviving letters were written to reassure those at home, hiding the realities of lethal environment. Butterworth’s last letter was written on the eve of battle. He was to participate in a diversionary attack, one of several, designed to divert German attention from the main assault in the Battle of Loos. This last letter was written to be held and posted in the event of his death. It is not a sombre note but it contains love and affection for school and friends, comrades and family. Butterworth accepts that his chances of survival are almost zero but he contemplates the coming battle with personal courage, acceptance of it necessity, but he makes no attempt to write down a comprehensive list of feelings. That may be to shield the reader but probably an indication of the duties on him as a company commander that denied him time to collect those feelings in the ordered form with which his writings take in all the earlier letters. The letters survived for ninety years before their rediscovery. The editor has added text and illustration that provides an introduction, including the family background to set the letters in a context that would have been known those originally reading the letters. This new book is a valuable addition to the story of the Great War, but it is also a very human story that delights, saddens, uplifts, and challenges. This affordable book has been produced with quality and attention to detail.